Things I’ve consistently been craving during this thing called pregnancy: fruit, pizza, and peanut butter. I mean…not together…ever…and I eat other things as well, but those are the things I keep wanting. There’s been all the fresh fruit I can get my hands on (Sean always asks me if I’m working on my “night-fruit”, a la Liz Lemon and her “night-cheese”), many pb&j’s, and pizza from our favorite local spot with the best happy hour deal. I’ve been throwing in a lot of kale as well…because balance, right? Truth: a year ago I would not have eaten raw kale salads without the saddest of faces, but lately I’ve been making it at home and ordering a mountain of it when we go to our favorite pizza place. Anyway, needless to say with peanut butter being one of my main squeezes, my yearly addiction to those damn Reese’s eggs is in extra full-force this year. They taunt me with their perfect peanut-butter-to-chocolate ratio. 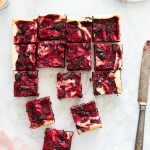 If you find yourself with a bag, or seven, of those sweet-sweet eggs and you want to do something with them other than shove them straight into your face (ahem, like me…) you should totes chop a few up and thrown them into some brownie batter. That way, you can pawn them off on your friends, family, coworkers, or any other willing passerby. 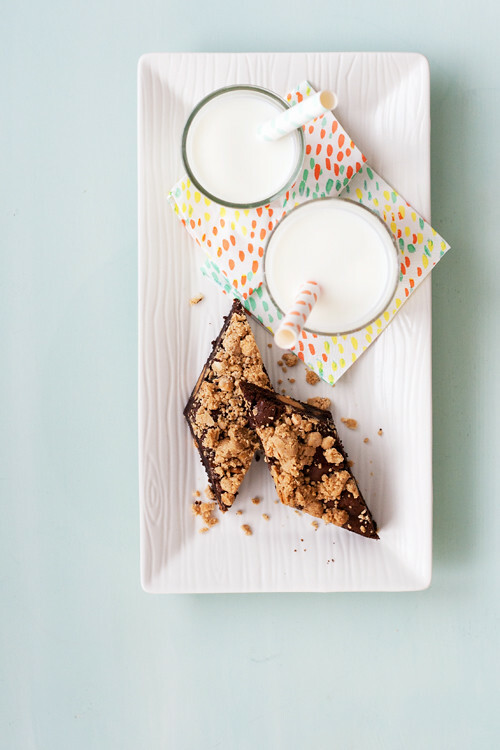 These brownies not only include those magical eggs, but also a peanut butter crumble on top…because extra peanut buttery goodness is always a good thing. 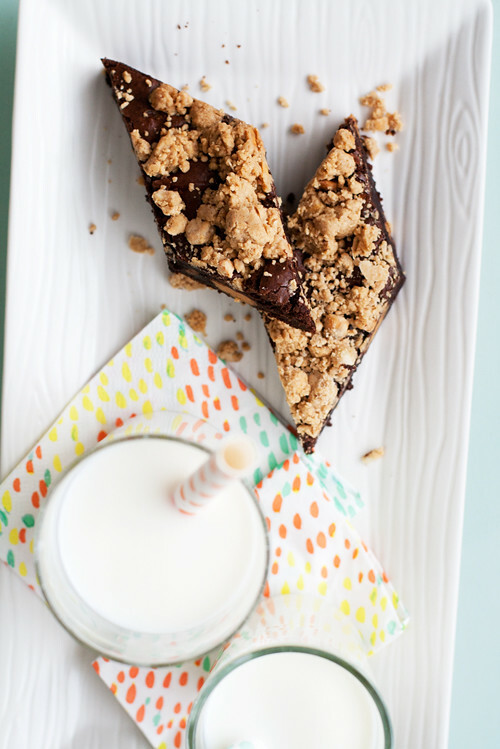 Fudgy brownies with peanut butter in the middle and crumbled over the top! Preheat the oven to 350ºF. Spray a 8x8 inch baking pan with cooking spray and line with parchment, leaving an overhang on 2 sides. Secure the overhang with metal binder clips. In a bowl, combine the peanut butter powdered sugar, flour, and nutmeg in a bowl. Mix together with a fork until a fairly dry crumble forms. Set aside. In a heatproof bowl set over a pan of simmering water, combine the butter, chocolate, and cocoa and stir occasionally until melted and smooth. Remove from the heat and allow to cool slightly. When the mixture is still warm, but not super hot, whisk in the sugar, followed by the eggs. After adding the eggs the mixture will be smooth and glossy. Fold in the flour, baking powder, and salt until just combine, then fold in the chopped peanut butter eggs (or peanut butter chips) and spread the batter into the prepared pan. Top the batter evenly with the peanut butter crumble and bake for 28-30 minutes or until a toothpick inserted in the center of the brownie comes out with a few moist crumbs. Remove from the oven and cool on a rack before slicing. These look like the stuff dreams are made of! I may be craving these for breakfast! What’s not to love about peanut butter and chocolate?! Love! Ahhh, those eggs! They get me every time. It’s ridiculous. I totes want to chop them up and eat them brownie-style now (doesn’t really solve my addiction to the eggs, but hey, BROWNIES). Pizza forever! I wish there were good watermelons right now, cause I’d be all over that! and I hope you like the Clarisonic!! Night fruit! Love it. Lovelovelove it. I hope you guys sing it just like Liz Lemon too, haha. 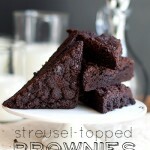 I’m digging the crumble top on them brownies, too! What a cool extra touch of goodness. Oh, we definitely sing it! 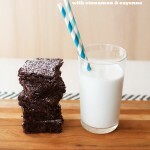 i’m not even a brownie lover (i know, i know, what kind of self-professed food blogger/baker am i?! ), but the idea of that peanut butter crumble is winning me over big time. i want to put it on everything! I mean, the crumble would be good on pretty much anything! I use to work at a pharmacy/gift shop when I was a teen and those Reese’s eggs were so tempting! I sadly haven’t had one in a while, but you are so right, perfect peanut butter to chocolate ratio! 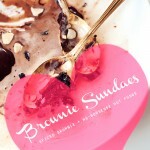 I love your pretty brownies with the cute crumbly top! It’s probably best to avoid even bringing them into your home! They are danger. Thanks, Nicole! Yesssss!! So yummy looking! I love this idea so hard! 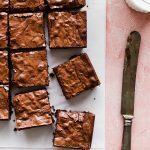 I’m definitely going to need approximately 100 batches of these glorious PB brownies! And I am so addicted to those Reese’s eggs. I bet I would fall even more in love with them on top of brownies (which I would probably put on top of a nice big bowl of PB ice cream :). 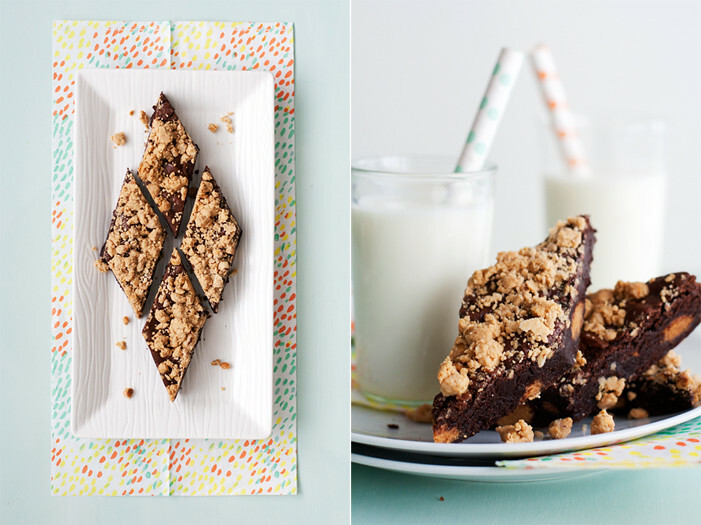 I’m so into this pb crumble idea! Yum/fancy! They are irresistible! Thanks, Tieghan! You had me at peanut crumble!! You can never go wrong with a great chocolate-pb combo! 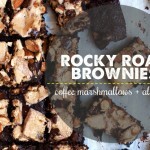 Yummmmmm… These look insanely delicious!! If I wouldn’t gain a bazillion, I could easily eat the whole pan! Thanks, Nicole! I had to give them away to keep from eating them all! These look crazy delicious. Seriously, anything that is chocolate + pb is an instant win in my book! I totally have to agree! Thanks, Graham!! Oh my goodness, thrse need to be tried ASAP! Peanut butter crumble sounds delightful! Pregnancy cravings sound crazy and a little bit fun! Ha, I’m dying over night fruit! Liz Lemon is my spirit animal, and my husband and I regularly break into song: “Working on my night cheese!” When I was pregnant I was all about toast with lots of butter and big pinches of sea salt, so I hear you on the power of pregnancy cravings. I am super into these brownies, and into the diamond shapes! Is this even real. Lady you have out done yourself. all my favorite things in one. My family will love these! I need this right now. This looks so good! I’m pretty much sold whenever I see anything with peanut butter! These look amazing! I need to come up with an excuse to eat all the peanut butter ever. These look awesome.